Charlotte, N.C. (March 28, 2013) – Pro Comp is proud to announce its partnership with Robby Gordon OFF-ROAD’s Stadium SUPER Trucks (SST), becoming the second tire manufacturer to sign for the 2013 Inaugural season of thrilling, stadium-style off-road racing. Robby Gordon OFF-ROAD’s Stadium SUPER Trucks is a new breed of off-road featuring live motorsports, bringing back what was once the concept of legendary racer Mickey Thompson. Robby Gordon’s new concept of Stadium racing involves high-powered off-road trucks racing on challenging dirt tracks consisting of huge jumps, crossovers, and tight corners. The 2013 season will be comprised of 12 events providing action in state of the art stadiums across the United States and one to be named International event. Since 1998 Pro Comp Tires has become a top-tire manufacturer contender in the extremely popular off-road aftermarket tire industry. Pro Comp Tires will have multiple Stadium SUPER Trucks equipped with its popular Extreme MT2. Drivers representing Pro Comp Tires in the series will be announced at a later date. Series Officials are excited to have Pro Comp committed and know that having multiple tire manufacturers in the series brings more competition to perform in the spotlight of off-road racing. Additional information about Pro Comp can be found at www.procompusa.com. All 12 Stadium SUPER Truck events in 2013 will be televised via tape delay and featured on NBC: seven on NBC and five to be televised on the NBC Sports Channel. Check local listings for channel and times. Keep up with the latest news and results on Robby Gordon OFF-ROAD’s Stadium SUPER Trucks Series at facebook.com/StadiumSuperTrucks and twitter.com/SSuperTrucks. Visit http://www.stadiumsupertrucks.com for more information including where to purchase tickets for the 2013 season. Pro Comp is a manufacturer for high-quality, durable products for on and off road enthusiasts including tires, wheels, suspensions, shocks, and more. Suspension systems were our original foundation and they continue to be one of our strongest departments as we develop innovative new suspensions. Later we took on tires and have become one of the top tire-manufacturing contenders in the aftermarket industry. Pro Comp Tires have been supported by the release of our Pro Comp wheels, designed to be the strongest steel and cast wheels on the market. Robby Gordon OFF-ROAD is a new breed of off-road featuring live motorsports, bringing back what was once the concept of legendary racer Mickey Thompson. 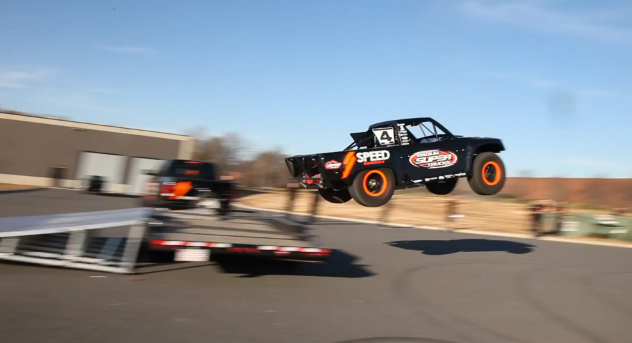 Robby Gordon’s new concept of Stadium SUPER Trucks involves high-powered off-road trucks racing side-by-side on challenging dirt tracks consisting of huge jumps, crossovers and tight corners. The Series is comprised of 12 heart-pounding events providing motorsports action in the greatest venues in the world. Professional drivers compete for a huge Championship purse, the biggest in off-road today. Other classes involve BIGFOOT® Monster Trucks, SUPER Trophy Karts and SUPER Buggy racing all held in stadiums that will keep you on the edge of your seat! Charlotte, N.C. (March 27, 2013) – 2009 ARCA/ REMAX Series Champion, veteran off-road competitor and current NASCAR Camping World Truck Series Driver; Justin Lofton will compete in the 2013 Inaugural Stadium SUPER Trucks season driving the No.6 Imperial Valley Full Plate truck. Stadium SUPER Trucks is modeled after the late Mickey Thompson Off-Road Championship and will take off-road racing to 12 state of the art stadiums across the country and abroad offering the champion a year-end prize of $500,000. The first race for SST and Lofton will take place April 6 at the University of Phoenix Stadium in Glendale, Ariz.
“I’m really excited to be a part of SST, I have watched it all come together, and I can’t wait to line up to the start line April 6th for the Inaugural race.” Stated Lofton. A native of Brawley, Calif. Lofton will go back to his desert racing roots in a specially engineered 600-horsepower Stadium SUPER Truck with support from Imperial Valley Full Plate group. Imperial Valley Full Plate consists of various vegetable, hay, and citrus farmers along with multiple electricians and cattleman who have combined with other business owners and friends of Southern California to utilize the national reach and fan base of Stadium SUPER Trucks to promote their products and services fully. 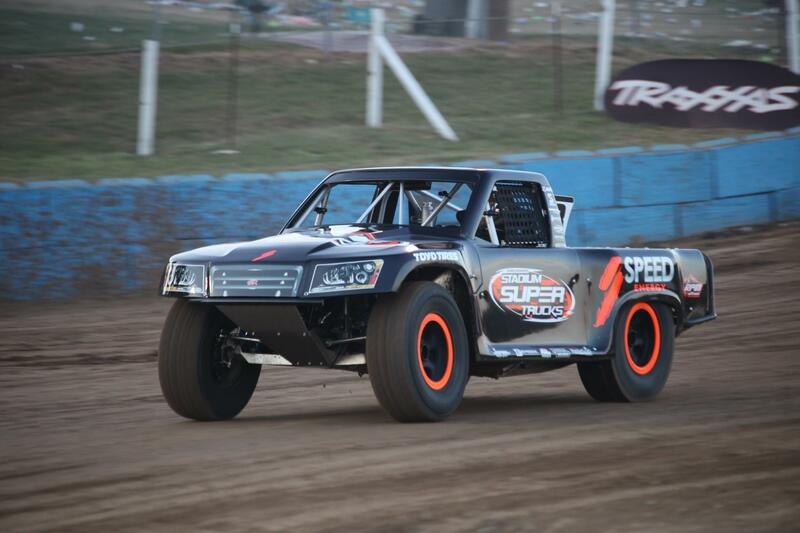 SST President Robby Gordon commented on Lofton as an addition to the Stadium SUPER Trucks for 2013. Charlotte, N.C. (March 26, 2013) – Jeff Ward, the first motocross rider in history to win every major AMA motocross national championship (125cc, 250cc, 500cc), and who later earned national acclaim on four wheels in both IndyCar and Off Road racing, has entered the Inaugural event of Robby Gordon OFF-ROAD’s Stadium SUPER Trucks™ April 6 at University of Phoenix Stadium in Glendale, Ariz.
Charlotte, N.C. (March 20, 2013) – Famed Motocross and off-road champion Ricky Johnson will compete in the 2013 Inaugural Stadium SUPER Trucks Season and will drive in the No.5 JEGS.com truck for the first three races. Gordon’s Stadium SUPER Truck Series is modeled after the late Mickey Thompson Off-Road Championship and will take off-road racing to several stadiums across the country. The first race for the series and for Johnson will take place April 6 at the University of Phoenix Stadium in Glendale, Ariz.
Johnson is a seven-time AMA champion, winning races in stadiums that are familiar to the SST schedule. He also is a four-time short course champion, winning titles in 1998 and 2010 in Pro-2, along with 2011 and 2012 in Pro-4. Johnson also will drive the No.5 JEGS.com truck on April 21 at the Toyota Grand Prix of Long Bach in Long Beach, Calif., and returning on April 27 to the site of his first stadium victory, Los Angeles Memorial Coliseum. Gordon’s new series features specially engineered, 600-horsepower off-road trucks racing against each on grueling dirt tracks with a huge jumps, crossovers and tight corners. The 2013 season will be comprised of 11 action-packed events in stadium venues across North America plus one International event soon to be announced. Additional information about JEGS High Performance can be found at http://www.jegs.com. Keep up with the latest news and results on Robby Gordon OFF-ROAD’s Stadium SUPER Trucks Series at facebook.com/StadiumSuperTrucks andtwitter.com/SSuperTrucks. Visit http://www.stadiumsupertrucks.com for more information including where to purchase tickets for the 2013 season. JEGS High Performance is a leader in the mail order automotive equipment industry. JEGS sells performance parts, aftermarket accessories, tools, and automotive clothing to enthusiast worldwide. Founded in 1960 by Jeg Coughlin, Sr. as a small speed shop, JEGS has involved to 225,000-square foot state-of-the-art distribution center, a mail order business, two retail stores, and the Coughlin family’s in-house race teams. Charlotte, N.C. (March 8, 2013) – MagnaFlow Performance Exhaust has announced its partnership with Robby Gordon OFF-ROAD’s Stadium SUPER Trucks™ (SST). As an associate sponsor, MagnaFlow will bring the proven quality, power, and sound of over 30 years to the inaugural season of thrilling, stadium-style off-road racing. Robby Gordon OFF-ROAD’s Stadium SUPER Trucks is a new form of live off-road racing, placing new life in the concept of legendary racer Mickey Thompson. Robby Gordon’s new vision of Stadium racing pits specially engineered, 600 horsepower off-road trucks with custom designed MagnaFlow exhausts side-by-side on grueling dirt tracks with a stream of large jumps, crossovers, and tight corners. “I’m really excited to have a long standing partner like MagnaFlow be involved in our series, for them to step up with a series that has not run an actual race yet and commit to all of research and development they’ve done over the last 8 months is outstanding,” stated Robby Gordon, President of Stadium SUPER Trucks. MagnaFlow a proven supporter of off-road racing and long-time supporter of Gordon throughout competition in NASCAR, SCORE International (Baja) and Dakar Rally events continues the relationship as Gordon transitions to series ownership. Venues include University of Phoenix Stadium (Glendale, Ariz.), Long Beach, Calif., Los Angeles Memorial Coliseum (Los Angeles, Calif.), Qualcomm Stadium (San Diego, Calif.), Edward Jones Dome (St. Louis, Mo. ), Soldier Field (Chicago, Ill.), Georgia Dome (Atlanta, Ga.), Cowboys Stadium (Dallas/Arlington, Tex. ), Metro Dome (Minneapolis, Minn.), Sam Boyd Stadium (Las Vegas, Nev.), and one to-be-named international event. Keep up with the latest news and results on Robby Gordon OFF-ROAD’s Stadium SUPER Trucks Series at facebook.com/StadiumSuperTrucks and twitter.com/SSuperTrucks. Visit stadiumsupertrucks.com for more information including where to purchase tickets for the 2013 season. MagnaFlow got its start as a natural extension of Car Sound Exhaust systems. Our parent company specializes in superior catalytic converter technology and has spent the last 30 years earning its reputation as a market leader around the world. We’re proud to continue this tradition through producing the best sounding, best performing and most durable exhaust components in the world. If you’re looking for quality, power and sound, then you’re looking for MagnaFlow. Please visit us at http://www.magnaflow.com for more information. Charlotte, N.C. (February 20, 2013) – Traxxas®, the Fastest Name in Radio Control® has announced their commitment to a two-truck franchise for the inaugural 2013 season of Robby Gordon OFF-ROAD’s Stadium SUPER Trucks (SST), becoming the first official multi-truck team. Robby Gordon OFF-ROAD’s Stadium SUPER Trucks is a new breed of live off-road racinginjecting new life into the stadium truck concept created by legendary racer Mickey Thompson. Robby Gordon’s new vision of Stadium racing pits specially engineered, 650 horsepower off-road trucks against each other side-by-side on grueling dirt tracks with a non-stop stream of huge jumps, crossovers, and tight corners. The 2013 season will be comprised of 12 heart-pounding, action-packed events in the greatest stadium venues across North America. Mike Jenkins, himself a seasoned off-road competitor, will drive the No. 47 Traxxas Slash SST. The driver of the second truck will be announced in the coming weeks along with the team’s official tire manufacturer. The presence of the world’s leading manufacturer of hobby-quality radio control vehicles will be known throughout the Ultimate OFF-ROAD Expo as they pull out all the stops for Traxxas Radio Control fun with products, contests, prizes, the Traxxas Girls, incredible, high-flying demonstrations at each of the Stadium SUPER Truck events throughout the season. The interactive Try-Me Track will give thousands of race fans the opportunity to take the wheel of a Traxxas Slash and put it through its paces on its very own off-road obstacle course. The Lincoln Electric Company, headquartered in Cleveland, OH, is the world leader in the design, development and manufacture of arc welding products, robotic arc welding systems, fume control systems, plasma and oxyfuel cutting equipment and has a leading global position in the brazing and soldering alloys market. For more, visit www.lincolnelectric.com. Charlotte, N.C. (February 21, 2013) – Robby Gordon OFF-ROAD’s Stadium SUPER Trucks™ (SST) announced today that longtime supporter, MAPEI will be a sponsor on Gordon’s No. 7 SST race truck for the 2013 season. MAPEI came on board with Robby Gordon Motorsports in 2006 as part of his NASCAR program. Over the years, the sponsorship has evolved to include every form of racing in which Gordon participates. The No. 7 MAPEI Stadium SUPER Truck will make its first appearance at the inaugural race at the University of Phoenix Stadium in Glendale, Ariz. on April 6. Other primary races will include Solider Field in Chicago, Ill. on June 22nd and Cowboys Stadium in Dallas, Tex. on July 13. MAPEI will serve as an associate sponsor on Gordon’s SST for the remaining nine race events. “MAPEI has been a huge part of our racing program over the years. To have them participate with us in the SST Series shows their continued commitment to our company, and I am excited to introduce them to a different style of racing,” says Robby Gordon. MAPEI Group, with 67 subsidiaries including 58 plants in 27 countries, is today the world leader in the manufacturing of adhesives and complementary products for the installation of all types of floor and wall coverings. The company also specializes in manufacturing other chemical products for building, including waterproofing products, special mortars and admixtures for concrete, products for the restoration of ancient buildings, and special decorative and protective coatings for walls. Eighteen MAPEI manufacturing facilities are located in the Americas, with headquarters in Deerfield Beach, Florida. MAPEI is an environmentally conscious manufacturer – the company has been a member of the U.S. Green Building Council since 2001 and a member of the Canadian Green Building Council since 2008. MAPEI Americas is a registered provider to the AIA/CES program and also offers training related to ceramic and stone tile, floor coverings and concrete repair through the MAPEI Technical Institute. The Quality Management Systems of the majority of MAPEI Americas facilities are ISO 9001 certified. Visit www.mapei.com for technical data or call 1-800-42-MAPEI (1-800-426-2734) for the nearest location. Charlotte, N.C. (February 19) – Toyo Tire U.S.A Corp is proud to announce its partnership with Robby Gordon OFF-ROAD’s Stadium SUPER Trucks™ (SST), becoming the first tire manufacturer to sign for the 2013 inaugural season of thrilling, stadium-style off-road racing. ps, crossovers, and tight corners. The 2013 season will be comprised of 12 heart-pounding events providing action in the greatest venues across North America. Toyo Tires® will have multiple Stadium SUPER Trucks equipped with its popular Open Country M/T® including that of No. 7 Robby Gordon. Toyo Tires first partnered with Gordon in 2006 and have maintained a winning relationship ever since. Gordon has delivered multiple championships, wins and podium finishes for the Toyo Tires brand. Accomplishments include the 2012 Best in the Desert Class 1500 Champion and Best in the Desert Grand Champion, 2009 SCORE Overall Point Champion and SCORE Trophy-Truck Champion, Overall 2006 Baja 1000 Winner and many Dakar Rally Stage wins. Additional drivers representing Toyo Tires in the series will be announced at a later date. Toyo Tires will also be the presenting tire sponsor at two televised events including the Season Opener at University of Phoenix Stadium in Glendale, AZ on April 6. All 12 SST events in 2013 will be televised via tape delay on NBC networks, seven on NBC and five on NBC Sports. Check local listings for channels and times. Venues include the University of Phoenix Stadium (Glendale, AZ), Toyota Grand Prix of Long Beach (Long Beach, CA), Los Angeles Memorial Coliseum (Los Angeles, CA), Qualcomm Stadium (San Diego, CA), Edward Jones Dome (St. Louis, MO), Soldier Field (Chicago, IL), Georgia Dome (Atlanta, GA), Cowboys Stadium (Dallas/Arlington, EX), Metro Dome (Minneapolis, MN), Sam Boyd Stadium (Las Vegas, NV), and one to-be-named international event. Toyo Tires offers a complete line of premium replacement tires for nearly every make and model including high performance cars, luxury vehicles, light trucks and SUVs as well as tires for commercial trucks. For more information log onto toyotires.com and connect with the community at facebook.com/toyotires, twitter.com/toyotires and gplus.to/toyotires. CHARLOTTE, NC (February 14, 2013) – Since 1975, America’s version of the Monaco Grand Prix – the Toyota Grand Prix of Long Beach – has seen legendary drivers in Formula 1, CART/Champ Car and IndyCar create some of the greatest moments in motorsports history. On April 21, history will be made once again with an unprecedented road course demonstration race by Robby Gordon OFF-ROAD Stadium SUPER Trucks™, which will run just prior to Sunday’s IZOD IndyCar Series® main event. It has been a long-time dream of Gordon’s to personally redevelop and bring back this unique form of off-road stadium racing that was immensely popular more than 20 years ago – known then as the Mickey Thompson Off-Road Championship. Gordon, who himself competed regularly on the streets of Long Beach in the mid-1990s scored a Trans Am win as well as a podium finish for the Toyota Grand Prix of Long Beach race in 1994. Gordon will be one of the many drivers who will race as well as become airborne (over specially constructed metal ramps) in the only event on the 2013 Stadium SUPER Trucks schedule slated to run on asphalt. Race fans will certainly get an eyeful as the Stadium SUPER Trucks go to battle, powered by 600-horsepower engines, going door-to-door on the 11-turn, 1.97-mile street course circuit for this special one-of-a-kind event. The Grand Prix exhibition will serve as the build-up to the Robby Gordon OFF-ROAD Stadium SUPER Trucks event scheduled the following weekend (April 26-27) at the famed L.A. Memorial Coliseum. The series then moves to San Diego’s Qualcomm Stadium on May 4 and May 18 for two thrilling venues to round out the commemorative California portion of the inaugural 2013 season. Gordon’s new series, based in Charlotte, debuts April 6 at University of Phoenix Stadium in Glendale, Ariz., with packed stadiums expected throughout a 12-race season. Other venues include Cowboys Stadium in Dallas, Soldier Field in Chicago, Atlanta’s Georgia Dome, Edward Jones Dome in St. Louis, and the Metrodome in Minneapolis. Ticket prices for the Grand Prix range from $28 for a Friday General Admission ticket to $130 for a three-day ticket that includes Sat./Sun. reserved seating in grandstand upper levels. Pre-paid parking packages are also available, along with handicapped seating, IndyCar Paddock passes, Super Photo tickets and a wide variety of Hospitality Club packages. Fans can select and pay for their 2013 Toyota Grand Prix of Long Beach seats, parking and paddock passes online at gplb.com. Ticket orders can also be placed by calling the toll-free ticket hotline, (888) 82-SPEED. Keep up with all the latest news and results on Robby Gordon OFF-ROAD Stadium SUPER Trucks Series by liking us on Facebook athttp://facebook.com/StadiumSuperTrucks & following us on Twitter athttp://twitter.com/SSuperTrucks. All information including where to purchase your tickets for the 2013 season can be found at http://www.stadiumsupertrucks.com.